FPBA and the Mayor and City Councilmembers of the City of El Cajon will attend the El Cajon Animal Shelter groundbreaking ceremony on Wednesday, May 24, 2017. Building on our extensive experience with the design of animal care facilities, FPBA was selected by the City of El Cajon to provide design services for a new single-story, 15,000 SF animal care facility, supporting the needs of El Cajon and La Mesa animal care program with future expansion to accommodate needs of surrounding communities. The facility consists of housing for animals, veterinary services for sick and injured animals, grooming areas, indoor and outdoor play/interaction areas, pet adoption and admission services, a multi-purpose room, administrative offices, miscellaneous storage and a small retail area for the sale of pet supplies. 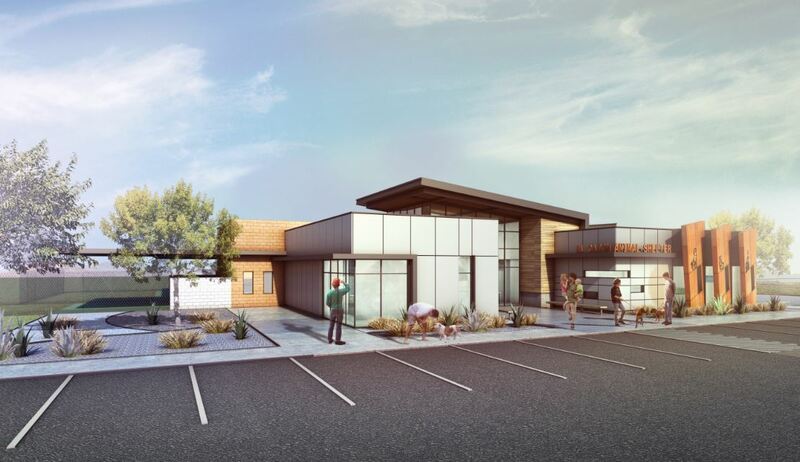 The project is designed to maximize operations efficiency and flexibility to accommodate spikes in animal needs while promoting health and wellness of its animals. Anticipated to begin construction at the end of the month, the new facility will be open to the public in 2018.